Movement, shelter and companionship are vital. Sometimes we just need to get back to the basics. While it can be exciting to try a new supplement or new gadget, if we push aside what our horses truly need, we set them up for real health challenges down the road. You probably already know these things, but may not have given them much thought in recent months. This article helps refresh our memories and asks us to look at these truths in a new light. It’s easy to spend a fortune on the next fancy feed or supplement. Sure, there are plenty of worthwhile products that may improve health and reverse illness, but none of them truly matter without first meeting these five foundational principles. These are true for all horses, regardless of age, breed, condition, or purpose. Even seasonal or regional variations do not alter these. Water must be freshened daily. Dead insects, bird droppings and excessive pond scum can poison your horse.2 Using smaller water troughs can make cleaning easier. During cold weather, horses drink less, especially if the water is ice cold. This potentially leads to dehydration – the main cause of colic in the winter. Heating water between 45 and 60 degrees F (7 to 15 degrees C) will promote more water consumption. Be sure the heater has no exposed wires that could electrify the water source. Do not offer electrolyte supplements instead of plain salt. Electrolytes are meant to replace perspiration losses and fed in addition to salt. Never add electrolytes to your horse’s only water supply. The digestive tract consists of muscles which are “exercised” by the steady flow of forage. “Flabby” muscles can twist or intussuscept (telescope) — increasing the risk of colic. An empty stomach causes incredible stress, creating a hormonal response that raises insulin, an inflammatory hormone that can bring on laminitis. Elevated insulin also tells the body to store fat. Don’t let anyone scare you into thinking that feeding hay free-choice will damage your horse. Please read Equine Digestion – It’s Decidedly Different to empower you with the knowledge needed to help your horses. Hay testing and commercially available “slow feeders”5 are worthwhile for many horses. Simulate the fatty acid content of grasses by providing a feed source that has more omega 3s than omega 6s. Chia seeds or ground flaxseeds are good choices. Horses need to move and have the protection of a buddy. Standing in a small area for hours on end (even if part of it is outdoors) takes its toll on your horse’s mental and physical health. So does being isolated from buddies. The stress can be so great that it dramatically diminishes your horse’s quality and length of life by compromising his immune system and hormonal responses. 1 Chastine, M.N., 2009. You can lead a horse to water… The University of Montana Western Equine Studies Program. 2 University of Kentucky College of Agriculture, Food, and Environment. 2015. 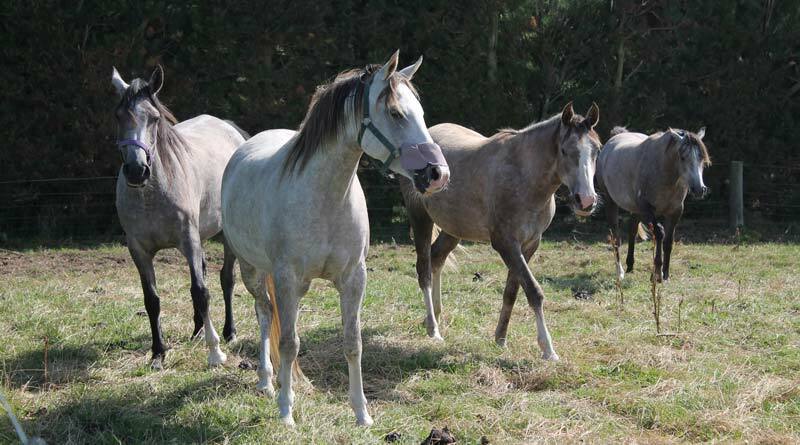 Blue-green algae poisoning in horses. The Horse. 3 Consider Redmond Rock or Himalayan salt. 4 Please read articles related to insulin resistance, overweight, and leptin resistance here. 5 A variety of slow feeders is available here.